After our fab (but early; we sat down at 7pm) dinner at Bodega 1900 we found a nice cocktail bar called Old Fashioned to chill in. It was small and cosy, had nice music on but you could still talk and an extensive cocktail list. Lovely! Also, all the staff were bearded men with white shirts and suspenders. Cute! I went for a Gin Tonica, the Spanish version of gin and tonic served in a large glass on a stem. I tried one with strawberry notes and it was served with a dried strawberry slice. Really nice! Emma asked for a fruity drink and received one with strawberries and raspberries. It was good fun sitting here chatting and people watching for a bit. Until we got hungry again and headed to nearby Bar Mut that I was drying to try. I so love that the restaurants here are open late. At Bar Mut there’s no printed menu, but some dishes are written on the board and your waiter will tell you the rest. You can also choose your fish and shellfish from the iced counter. Everything’s fresh and seasonal. Simple, but not too simple. We started off with white asparagus that were perfectly cooked, and served with a light mayonnaise, nuts and leaves. I’ve never been able to resist croquetas and this time was no exception. These big ones with iberico ham were amazing! Our last dish (I mean, we had had a proper dinner earlier that evening) was a this lovely beef dish with morels and a delicious sauce. We walked out happy and full, heading back to the hotel in our taxi for another full day of exploring Barcelona the next day. They don’t have Uber here but other similar taxi companies (the one we used had its own fleet and all cars had free water and wi-fi – so good!) that we used a lot, especially in the evenings when we were tired from walking all day. There were plenty of lunches, fika and dinners with friends and family when I was back home in Sweden for Christmas and one day I got to try the fairly new Korean restaurant Namu for lunch with my friend Helena and her baby. It was still pretty quiet in town this third day of the year but an early quiet lunch was perfect with a baby present. The lunch menu at Namu was short but nice and consisted of three dishes; bibimbap with either beef bulgogi or tofu or a Korean wok. We both decided on the first option and very much enjoyed it! I had mine without kimchi and kale as my stomach can’t handle it, but it was still really nice. The creamy 63 degree egg made it feel rather luxurious for a weekday lunch and the flavour of the bulgogi was spot on. We also got a bowl of soup on arrival and coffee or tea is complementary for lunch. Can’t wait to try their dinner menu next time I’m in Malmö. The team behind the amazing meat restaurants Goodman (and Beast and Burger & Lobster) opened a new meat restaurant in the space where the fish restaurant Rex & Mariano (also owned by the same company) used to reside. In fact, they still use the Rex & Mariano crockery. Zelman Meats (after the founder Mikhail Zelman) is a mid-market steak restaurant offering “All we do is beef, and we stick to what we know best” according to the website. The menu is simple, with just a few starters, four different cuts of beef, sides and a few puddings. I like this simple no-fuss approach, which also makes the ambiance relaxed. It’s not white table cloths like Goodman, just good steak and sides in a relaxed restaurant. This is where to go to pig out on great steak, because the bill won’t be that bad and the meat is just as nice here as at Hawksmoor or Goodman. Take your date or a group of friends and just let your hair down. The staff is really friendly and relaxed but with a sincere passion for steak so they can guide you through the cuts and let you know what’s best served rare or medium. I came here with two colleagues for lunch, and as only one of us has a big appetite we ordered modestly to begin with, some delicious picanha and amazingly smoky and tender short rib. Once that was demolished we ordered more of the same and enjoyed it with crispy chips, salad and the two sauces on the menu. It was great and even the least meat eater out of the three of us (obviously not me) loved every bite! On Sunday when Emma and Claes were visiting, we wanted to make the most out of their last day here. So we got up faily early on Sunday for a walk around Westminster, followed by art spotting at the National Gallery, then a walk to Covent Garden and Opera Tavern where we were going to have lunch. I have been to this restaurant quite a few times now, and it is always really busy, apart from, apparently, around lunch time on Sunday. Fair enough, tapas is not the tradional Sunday meal, but we really enjoyed our lunch here. We were freezing after our walk, so we jumped straight to the hot foods on the menu, which made our waitress give us a funny look. Unintentional of course, and we just found it funny. To start, we had some grilled bread and alioli. After inhaling that we could be civilized and actually enjoy the food. 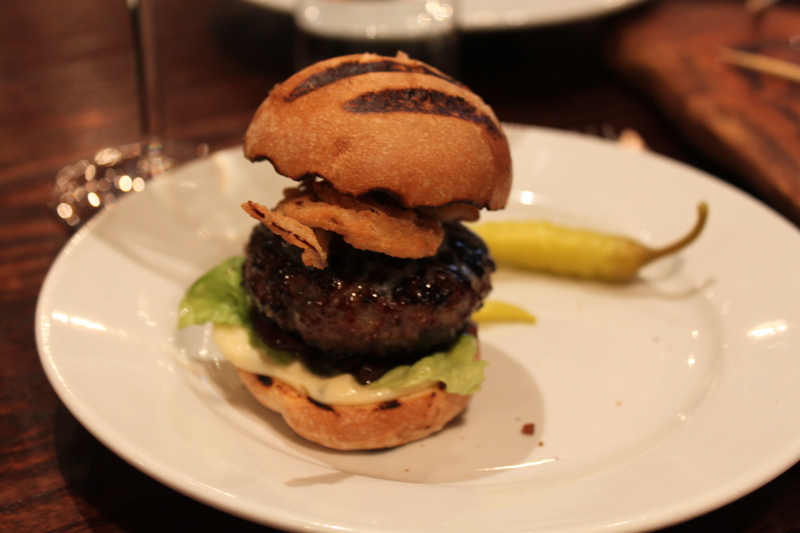 I had promoted the amazing mini pork and foie gras burgers, so Claes and I had one each and thoroughly enjoyed them. 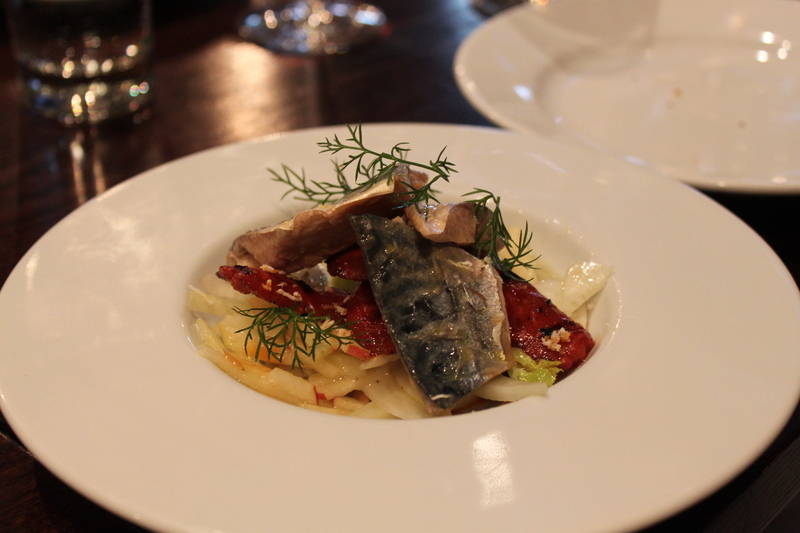 Emma chose mackerel with fennel and apple salad and fried chorizo instead and loved every bite. 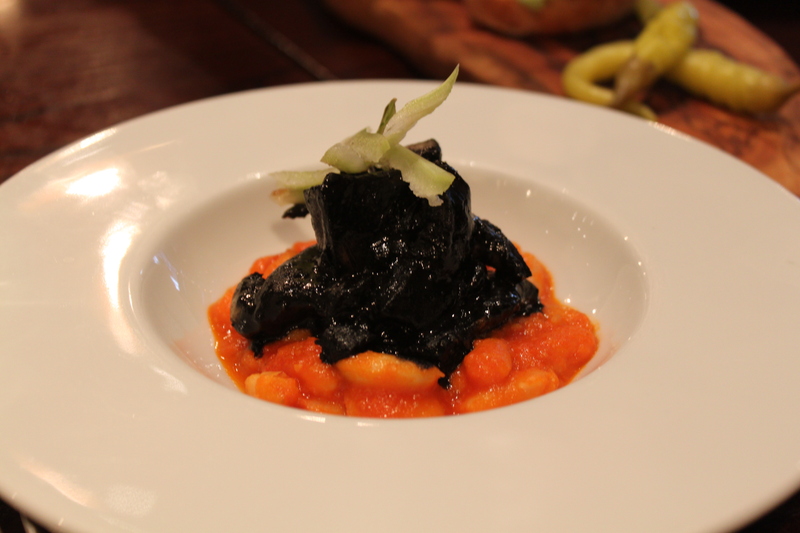 The rest of the dishes we shared and the first one was cuttlefish (with ink) and a cannellini bean stew. Sublte flavours but it was a lovely dish. 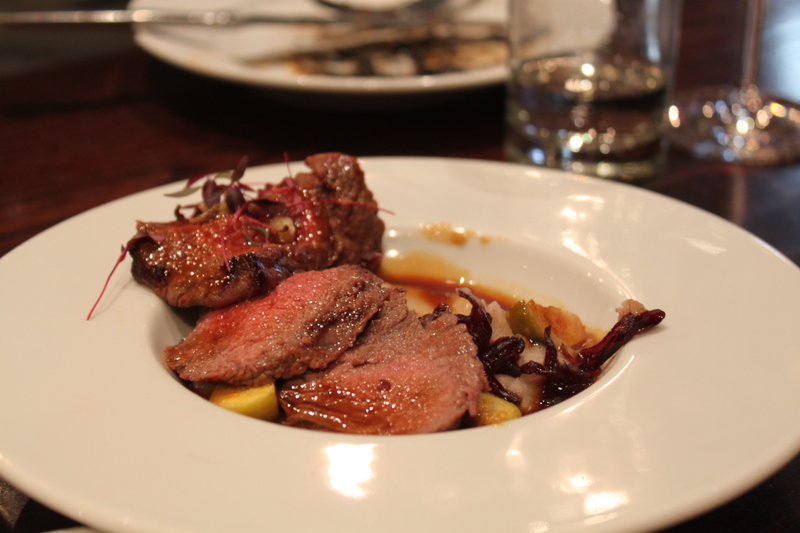 We then had tender slivers of beef with velvety celeriac puree, brussel sprouts and red cabbage. Absolutely lovely! We also had the classic patatas bravas with two dips. Not amazing, but totally what we expected. 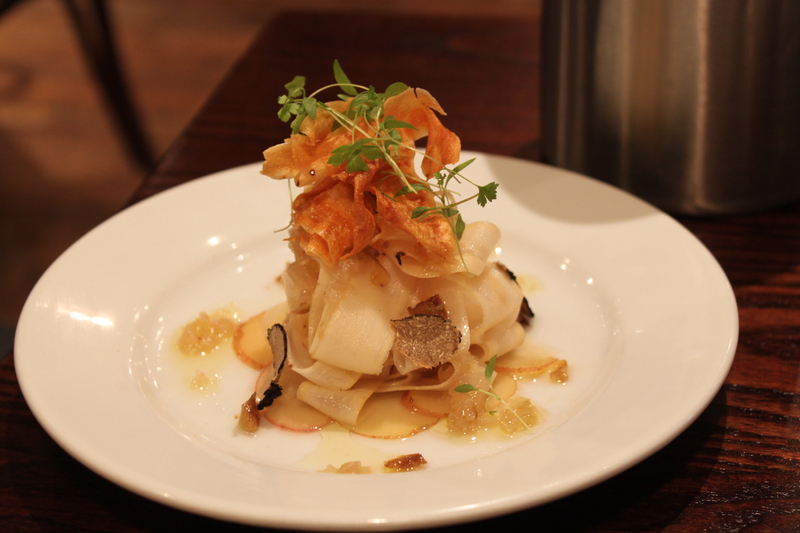 We also shared a fresh salad of pickled salsify with truffle and root vegetable crisos on top. It was very different but delicious. After all of this, we were full but wanted something more anyway, so we ordered another round of bread and alioli and some cheese. 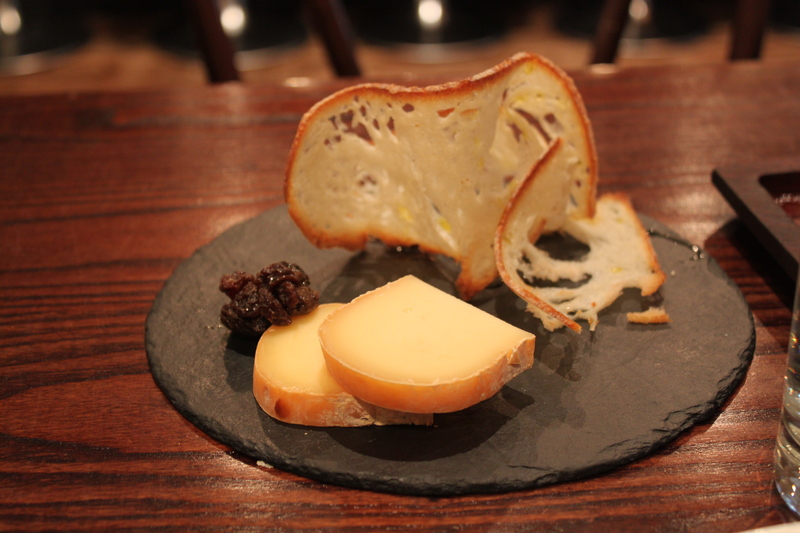 We settled for a menorcan hard cheese made of cow’s milk, called Mahon. It was quite firm and reminded me of pecorino a little. After this and a bottle of wine, we were no longer freezing and could go for another walk before it was time for Emma and Claes to head to the airport.